With the car packed up, we left Paris and set out for Normandy. 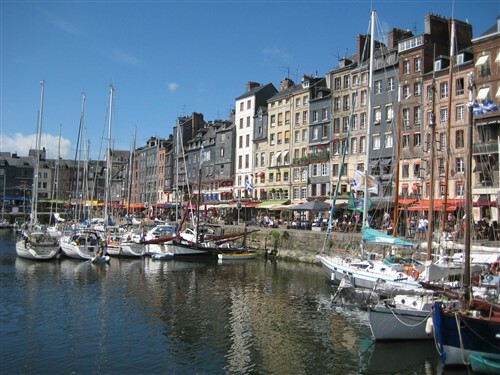 My parents had recommended a stop in the historic seafaring town of Honfleur along the way and we decided that we should not miss it. The picture-perfect town was situated around a small harbor full of extravagant pleasure boats. Surrounding the harbor were outdoor cafes and boutique shops in gorgeous old buildings with flower boxes in every window. Since I couldn’t walk far, Aaron dropped us off in the main square and parked the car. We made one slow, careful lap around the harbor, stopping for a lovely lunch of salads and mussels on the water and again for cones of gelato. The town was drenched in bright summer flowers and overtaken with impeccably dressed French and foreign tourists. I found myself longing for a sundress, pretty sandals, and an afternoon to wile away sipping French wine on the deck of my sailboat. We took some last photos, vowing to return someday with the budget of two-week vacationers, and said goodbye to beautiful Honfleur. Hours later, we reached our destination for the night – the tiny town of Ceaux in Lower Normandy, just ten minutes from Mont Saint Michel. We could see the abbey in the distance as we searched for our hotel and, after quickly settling into our room, we went right for it. 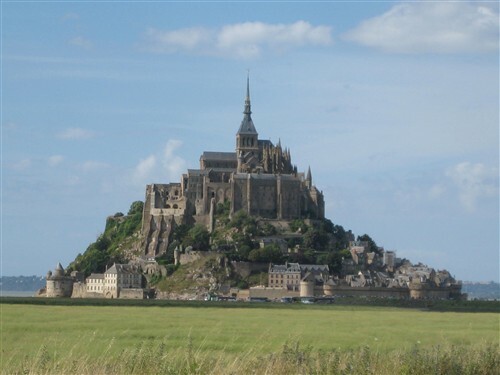 Rising from the flat golden plains like a Gothic fairy tale castle against a backdrop of ocean meets sky, Mont Saint Michel casts an awe-inspiring silhouette. The Mont sits atop a small rock island connected to the mainland by a natural bridge. At low tide, the island is surrounded by flat white sand and is only fully surrounded by water during seasonal equinoxes. A tiny town with a population of only 42 rounds the circumference of the Mont within an old stone wall. Catering to the throngs of tourists, the lower floors of the buildings have all been converted to souvenir shops and restaurants, creating an avenue of crowded commercialism around the abbey, though Mont St Michel remains a fully functioning town complete with a post office and garbage service. My post-surgical handicap precluded me from tackling the many stairs inside the Mont so I parked myself inside a café with a Nutella crepe while Aaron and Valerie ventured further inside. On our way out of town the next morning, we stumbled upon a beautiful field of wildflowers edging the pale blue ocean. Aaron and I hopped the low barbed wire fence and waded into the patch of red, white, violet and pink blossoms. By the time we’d finished frolicking, at least four more cars had stopped along the shoulderless two-lane highway to join in. The French traffic was not amused and conveyed as much with their annoyed honking. 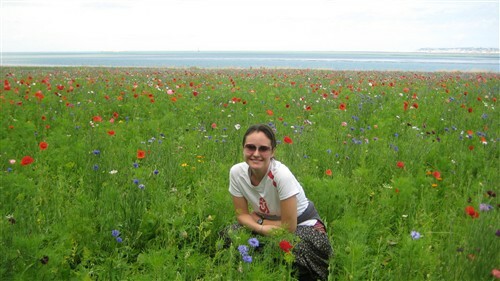 We didn’t care, though; the wildflowers in Normandy were simply too beautiful to miss. Back in Paris, we have acquired a traveling companion for the next few weeks – Aaron’s mom. She arrived in the morning with big smiles, big hugs and lots of presents! I felt awful that she would have to endure a bit of our stressful medical issues during her vacation but, at the same time, I was glad to have her with us. We spent four nights in Paris during which I was in and out of commission as determined by my “ailment”. Together we visited the Eiffel Tower, the Louvre (one of my favorite places in the world), walked along the picturesque Seine and down the Champs-Elysees. Our pace was much slower than that of our trip to Paris during which we excitedly rushed around to see everything. 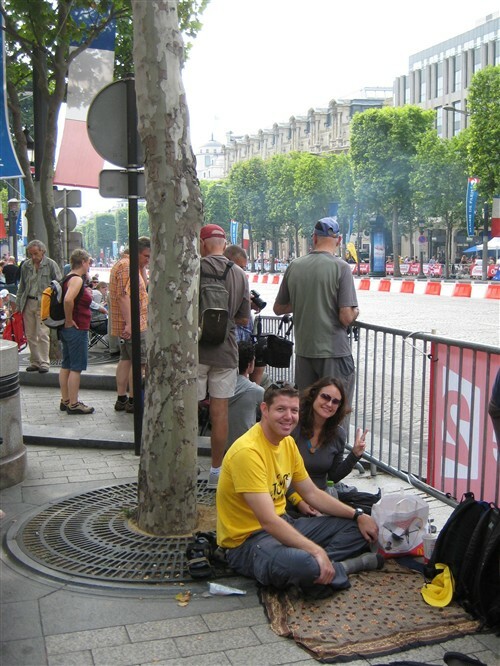 On Sunday, we arrived early at the Champs-Elysees, where we would camp out all day in the sun to mark our spot for the finish of the Tour de France. 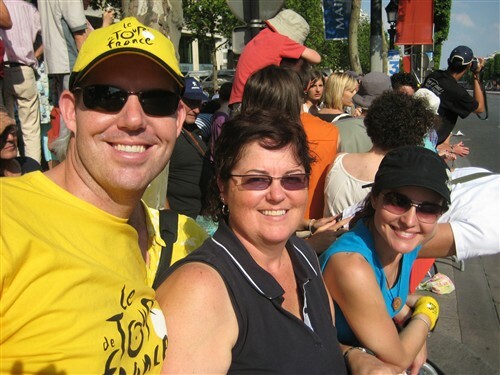 This was Aaron’s day and he was decked out in the Tour’s signature yellow for the occasion. We claimed a prime spot near the Arc de Triomphe next to a nice American family with whom we visited throughout the day. The hours passed surprisingly quickly and, as mid-afternoon approached, the crowds grew increasingly dense. When the caravan arrived, it was ten times as raucous and rowdy as it had been in Grenoble. By this time, we could no longer sit down but had to stand for the last several hours to maintain our front row spot. The racers arrived over an hour past the printed schedule time but the crowd was immediately forgiving; it wailed in unison as the triumphant athletes performed eight laps around the Champs-Elysees. As Aaron explained, the winner of the race and le maillot jaune (the yellow jersey) had already essentially been decided in an earlier stage. The final laps around the Champs-Elysees were more like victory laps for the entire peloton. From our prime position along the northern curb, the riders were within an arms length of us. In fact, we had to be careful when reaching our cameras over the barrier not to clothesline the outermost riders in the peloton. The scene was electrifying – a brilliant spectacle of bright colors and finely-chiseled bodies cheered by a madly roaring crowd. At the end of the day, we were utterly exhausted. We braved the crowded metro system back to Montmartre, picked up dinner on the street, and hibernated until morning. On Monday morning, we were back at the hospital for another ultrasound followed by emergency surgery, though it was more of a scheduling emergency than a medical one, since we planned to depart from Paris on our road trip the next morning. Having endured this surgical procedure twice now, once in Texas and now in Paris, has provided a basis for comparison between American medical and French medical care. While I would characterize my experience in the British-French hospital as adequate (and worlds above the standards in China and Nepal), I have a newfound appreciation for the American standard of service as applied to surgical care. Subtle differences in my Texas surgery, involving pre- and post-surgical service, made a big difference in the comfort and quality of my overall experience. I have heard and participated in discussions for years, usually around election time, about the need for American health care reform. While I cringe at the cost of prescription drugs and ever-increasing co-pays and the cost of medical care in general, I hope that whatever reforms are implemented in the coming years do not diminish the rigorous quality standards of American medical care. My surgery had been completed by one p.m. but I was not discharged from the hospital until six. Aaron and Valerie had picked up the rental car that afternoon and Aaron drove us back to Montmartre. I had a box of painkillers and the reluctant blessing of my surgeon to travel the next morning if I was feeling up to it. Barring any obvious complications, I was quite certain that I would be. After an overnight flight from Kathmandu, we arrived in Paris and found our hotel in the historic and eclectic neighborhood of Montmartre. We were surprised by the briskness of the air in the midst of summer and it was a welcome reprieve from the unforgiving heat of Nepal. It was nine a.m. and we could not check into our room until 3:00 so, after dawdling around the lobby for a while, we decided to try to get in to see a doctor at one of the hospitals. We opted for a British-French semi-private hospital (France has socialized health care) and miraculously got in to see a doctor and have an ultrasound that afternoon. The outcome was sad but conclusive…finally. Surgery seemed the logical next step, given our strict travel schedule. However, we were unwilling to thwart our plans to leave for Grenoble the next morning and opted to deal with the surgery issue upon returning to Paris in a few days. Although we did spend our entire first day back in Paris at the hospital, we were thankful for the opportunity to be seen on such short notice. We returned to Montmartre just in time to check into our hotel, grab some delectable takeout, and melt into bed. Grenoble was beautiful. The three-hour train ride from Paris took us through plots of sunflowers, golden fields with centuries-old farm houses, and the magnificent French Alpes. 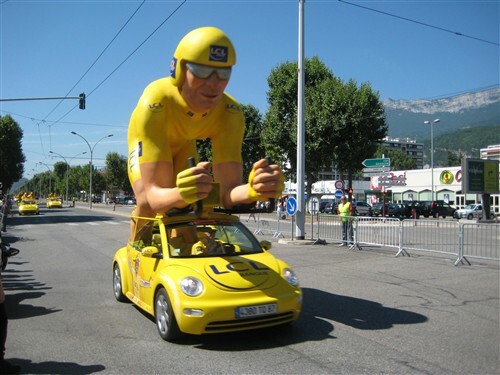 We had come to watch a stage of the Tour de France, which finishes atop a mountain called Alpe d’Huez. In planning this little detour, we were disappointed to discover how scarce and inadequate was the information online regarding the logistics of watching the stage on the mountain itself but we assumed that there would be plentiful info and public transport options for ushering the flood of cycling fans up the hill come race day. Our preoccupation with health issues for the past month had caused us to arrive in Grenoble completely unprepared. We realized when we disembarked from the train that we had no idea where our hostel was or how we were supposed to get there but, after that initial stressful realization, we pulled it together and found our way via public bus. The hostel staff knew little about the Tour and, since Alpe d’Huez was the next afternoon, we dropped our bags and headed straight back to town to seek information. A few frustrating hours of pounding the pavement in Grenoble yielded the following: 1) the road to Alpe d’Huez would be closed on race day; 2) there was no public transport available since the road would be closed; and 3) no one in Grenoble gives a damn about the Tour de France. Our only option was to rent a car that day, drive up the mountain, and sleep in the car. Naturally, almost all of the rental cars in town were already rented and the few that were available were exorbitant. As fate would have it, we would instead watch Alpe d’Huez in a small corner tavern with a big screen T.V. 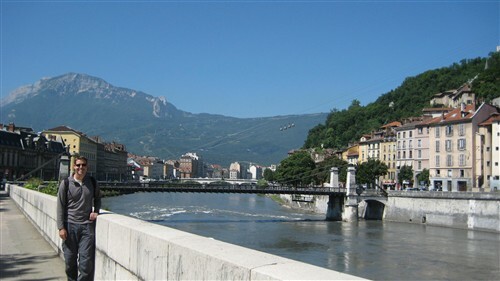 Determined to make the most of our visit to Grenoble, we spent our second day taking in the town. Wandering through the historic town center, we marveled at old stone churches and quintessential French architecture with its signature wrought iron detail. The narrow cobbled streets were lined with outdoor cafes, patisseries, and fruit and vegetable stalls. At la rue Chenoise and la place aux Herbes, a quaint and busy courtyard surrounded by 14th-18th century homes, the aromas of the daily fruit, vegetables and spices market filled the air. The colors, smells, and quiet bustle of the locals buying their fresh ingredients for the day brought to mind the concept of the art of living. I thought briefly of the shopping in the States – the “big box” stores like Walmart, Target, Costco and American grocery chains. In comparison to this beautiful, artsy neighborhood with its butcher, baker and candlestick maker, the “big boxes” seemed vulgar and utterly lacking in personality. Still, in spite of its status as an unapologetic bastion of consumerism, the United States of Awesomeness (thanks, Trish, I love that!) has the best shopping in terms of variety, quality, service and convenience on the planet Earth. With the exception of Martha Stewart and her loyal disciples, we seem to have forsaken much of the art of living with our “big boxes” but while there is a beautiful simplicity to the art, I’ll take Costco any day. After hours of aimless wandering through the historic streets, we walked along the river snaking through the northern edge of town. It was lined with some of Grenoble’s prettiest old buildings. 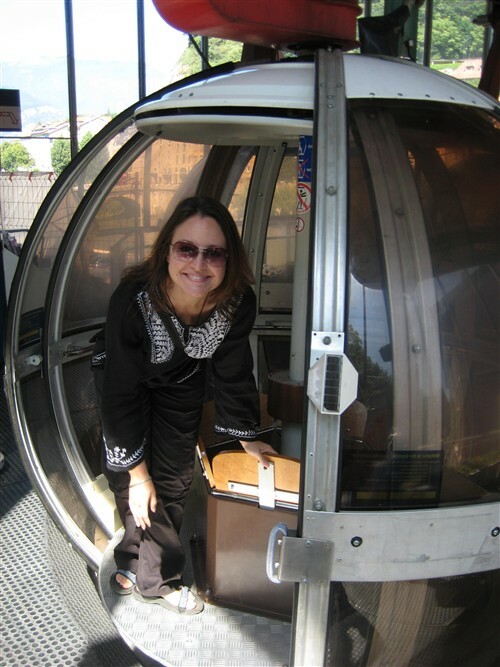 We rode the cable car to La Bastille, an old wartime fortress on the mountainside to take in the spectacular panoramic views of the valley. After that, we picked up some cheese and a warm baguette and made a picnic in the park. The weather has been absolutely gorgeous and the parks were full of people, young and old, enjoying the abundant summer flowers and fresh air. It was a lovely sight. On our last day in Grenoble, almost as if to atone for the impossibility of Alpe d’Huez, the Tour de France race course ran along the main street just outside our hostel. Hours before race time, we joined the locals in lining the curb, patiently awaiting our chance to steal a glimpse of the riders. We left on the evening train back to Paris – to meet Aaron’s mother who would fly in the following morning; to get closure on the miscarriage; and to revisit one of the most amazing cities in the world. Comments Off on Goodbye Asia; Hello Europe! This post contains a reference to recent medical problems with our pregnancy while traveling through China and Nepal. We originally omitted the stories so as not to worry our friends and family but since the pregnancy has come to an end we have decided to share the details of our saga. We have added some additional posts and have pre-dated them to appear in chronological order. To follow the story from the beginning, start with “The Grand Finale” and the story of our visit to a Chinese emergency room. We returned to Kathmandu on an air-conditioned minibus, still anxious to leave Nepal. Due to our medical issue, we’ve been confined to Nepal’s two major cities and their nearby medical facilities, exacerbating our anxiety. This precluded us from trekking in the Himalayans or going on safari in Chitwan National Park to stalk Bengal tigers, but it was our reality. After the relative peace of Pokhara, Kathmandu was like a splash of cold water on our faces. The incessant honking horns and chaotic, traffic-filled streets made us reluctant to leave the serenity of our room at the Tibet Guest House. On the occasions when we did venture out, there were shopkeepers who expectantly greeted us as we passed their stores, hoping we’d stop to look at their tired wares. And there were beggars and rickshaw touts and trekking guides and a laundry list of others eager to separate us from our remaining rupees. After spending five of the last seven months in Asia, the majority of time in poverty-stricken developing countries, our patience and tolerance has worn thin. It’s unfortunate that our “Asia fatigue” has so negatively colored our last month of travel through China and Nepal. We’ve both agreed that had we visited Nepal or China as “two-weekers”, or without the anxiety of managing an impending miscarriage in a Third World country, our perspectives might have been different. C’est la vie. 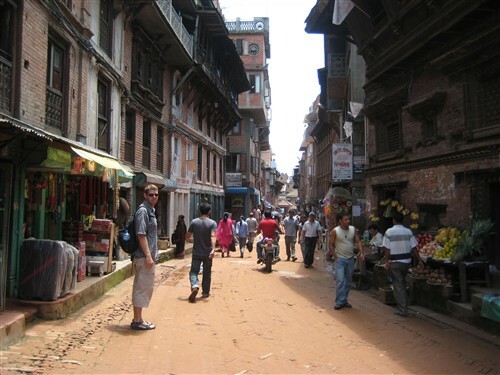 So with the exception of a quick day trip to the ancient city of Bhaktapur – the oldest and most pedestrian-friendly of the three cities in the Kathmandu valley – we hid out in our room, forced to bide our time until our flight to Paris. But our time in places like Nepal has given us a different perspective on world affairs. Like everyone else in the world, we’ve been anxiously following the subprime mortgage debacle and the US economy spiraling downward into a recession; banks are defaulting on loans and deposits and gas prices have soared to record highs. We certainly aren’t immune to these affects even as we travel; the exchange rates of the US dollar to many major currencies are at all time lows, the interest accrued on our ever-shrinking pot of travel money has slowed to a trickle, and the cost of petrol has made every mode of transportation more expensive. We are, in fact, planning to return to the US by the end of the year, shortening our intended itinerary, because we’re over budget, though it is as much attributed to our own decadence as to the fuel prices or dollar’s decline. But let me paint a picture for you of how the fuel crisis is affecting Nepal, this tiny country on the other side of the world. The increasing global oil prices have created a nightmare for one of the world’s poorest nations. The Nepal Oil Corporation (NOC) is a state-run company and the sole supplier of petrol products for the country, sourcing the majority, if not all of their oil through contractual agreements with India. But with rapidly rising oil prices, the cash-strapped corporation has been unable to continue purchasing petrol from their Indian partners. The result of this price increase is unbelievable. Petrol stations in Nepal are closed during the day, opening only in the evening; and that’s only if the daily petrol truck arrives. Lines begin forming early in the afternoon and swell throughout the evening, lining city streets and congesting the already narrow roadways. Drivers wait in lines stretching more than a mile long, often waiting five or more hours for their turn at the pump. Traffic slows to a crawl on the crowded streets. The lines are guarded and traffic is tightly controlled by the Nepalese Army – tensions are high. If a driver actually reaches the pump and petrol is available, it costs the equivalent of $9 per gallon – double what it costs in the US – with the price increasing each week. And that’s if it’s even available! Our last week in Nepal, the NOC announced that they no longer had enough cash to continue purchasing petrol and they were trying to secure interim financing just to continue operations. As a result, less than one-third of Kathmandu’s normal petrol needs were being met, crippling Nepal’s infrastructure. For a nation already dependent on handouts from the world to keep it functioning from one day to the next, the immediate future doesn’t look very bright. Tina wasn’t interested in anything involving camping but I was eager for another outing, so I ventured out alone on an overnight rafting trip. One of the local rafting shops, Paddle Nepal, put together a two-river, one night camping package; a surprising feat in the off-season. With our experiences on the Zambezi setting the standard, I was keeping my expectations low. Our party consisted of one guide, three safety kayakers, and six rafters: four twenty-something British girls – volunteer teachers at local schools – and a young professional woman from San Francisco on holiday. After brief introductions and the short bus ride to the drop point, we were briefed on the requisite safety procedures and set off down the Seti River. The lower Seti, normally a slow-moving, tranquil flow dissecting a lush river valley, swells significantly during the monsoon rains. The cold murky brown water ran fast and delivered a thrilling ride with big waves and long, washing-machine rapids. The Class III-IV rapids were fun, but markedly calmer than those on the Zambezi – a relief for the fearful first-timers on our trip. We survived the first day without a single casualty – nobody fell out of the raft – and we arrived at our sandy riverside campsite in the early afternoon. Our campsite was at the confluence of two rivers, the Seti and the Trisuli, which we would raft the following day. Our guides set up camp and cooked a wonderful spaghetti dinner; and I fell asleep early to the pitter-patter of rain drops falling on my tent. This was my first night apart from Tina in almost a year. The next morning we were surprised to learn that we would be taking local buses instead of chartered transport. It wasn’t a big deal but I soon realized that it was going to be a lot longer day than I had anticipated. We hailed down a nearly full local bus heading upriver, and after loading all our gear onto the roof, we were off toward our drop point on the Trisuli. By the time we reached our stop and descended to the river’s edge, the rain was pouring down, really pouring, like where’s-Noah-with-the-Ark pouring. The Trisuli River was significantly colder than the Seti and with no sun, torrential rain, and violent rapids; I was chilled for the entire ride. 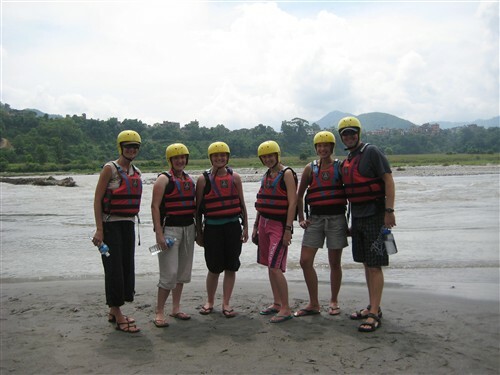 The trip downriver was fun but underwhelming as our guide steered clear of the more menacing and fun-looking rapids. Our short two-hour ride was over as quickly as it had begun. After waiting a frustrating three hours for a suitable local bus to deliver us back to Pokhara, we loaded up and were once again on the move. We’ve taken plenty of local buses during our year on the road and while they’re always a fascinating looking glass into the local culture, they are also slow, uncomfortable and otherwise miserable. The 100km trip back to Pokhara, with a chartered vehicle and normal traffic, should have taken little more than two hours. Our local bus took five hours. This is completely explainable of course – the local buses stop at every town and small village and every place in between where someone’s standing on the roadside waiting to be picked up. We were also delayed by a local strike – an everyday occurrence in Nepal where people go on strike for every imaginable reason – which blocked the main arterial road linking Pokhara and Kathmandu for nearly five hours. Luckily, we arrived as the strike was dissolving and only waited for about thirty minutes before traffic began moving once again. The return trip, while long, was still incredibly interesting. Every local who boarded the bus argued ferociously with the conductor about their respective fares and I stared in amazement as the negotiation unfolded, wondering if, somehow, I could absorb some of the natural negotiating prowess each possessed. I watched through the bus window as a live chicken was decapitated before my eyes by a Nepali man preparing dinner on the doorstep of his rural home. On another stretch of road I saw a group of knife-wielding men huddled around a fresh buffalo carcass, skinning and carving up the dead beast. While it is decidedly more difficult to shock or impress me at this point in our adventure, there are times when I’m still amazed by the things that I see. But then again, it’s just another day in Nepal.